Wide-scale protests against harsh social development budget cuts over next 20 years are taking place in Brazil. Meanwhile, former President Dilma Rousseff has promised to produce evidence of interim leader Michel Temer’s corruption. Protests against “the government’s conservative agenda,” namely the Proposed Constitutional Amendment (PEC 55) introduced to Congress by President Michel Temer, began sweeping the country early Friday morning. 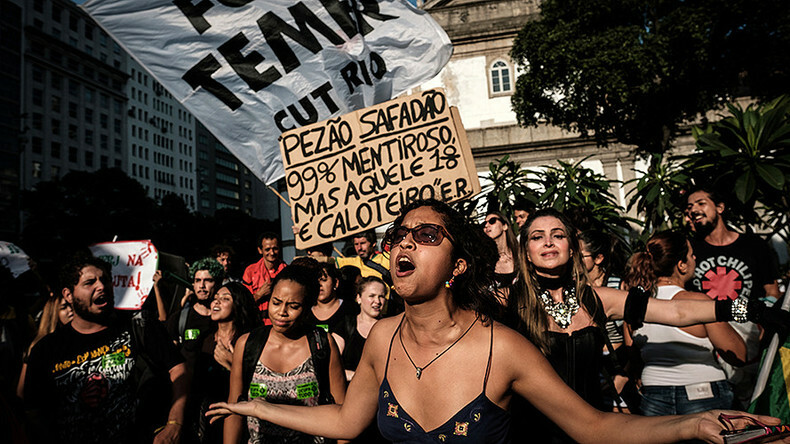 Citizens of at least 19 out of 27 Brazilian states and the Federal District participated in the protests. PEC 55 is an amendment which will freeze all the investments in the country’s public services for 20 years. As well as targeting harsh social and labor policies, protesters were critical of the government and the provisional president, who they call “the usurper”. The nationwide protests are the only means for “our conquests [to] not be buried by a coup and illegitimate government,” according to the Brazilian Labor Union’s (CUT) statement. Demonstrations, partial stoppages at work, delayed entries to work shifts, popular rallies, assemblies and interruptions to public transport services are among protest activities taking place. CUT sees a general strike as the possible culmination of protests, if the current government wouldn’t back off, according to organization’s president Vagner Freitas. The protests started a day after the Constitution and Justice Commission of the Federal Senate approved the PEC 55, which Temer and his cabinet see as one of the measures required to fix the economy. Political uncertainty after Dilma Rousseff’s impeachment, as well as the actions of the new government, have caused Brazil's currency to fall by 5.7 percent so far. Temer warned the protesters not “to use physical force to occupy [public buildings] or burn tires on the streets to block traffic,” since, according to him, it is necessary to learn to respect institutions. The president’s warning, seemingly, had little to no effect, since multiple videos showing protesters marching, barricading roads and otherwise not “respecting institutions” by other means have emerged. Meanwhile, ousted former President Dilma Rousseff, accused Temer of accepting a “payment” of one million reals ($250,000), allegedly from Otavio Azevedo, the former head of construction firm Andrade Gutierre. Azevedo, however, testified that the payment was made to Rousseff herself, but her lawyers said that they were in possession of certain documents proving this wrong. Rousseff was impeached by the Brazilian senate in September over alleged “budget manipulations.” Temer, the vice-president at the time, was promoted to serve the rest of Rousseff’s term, ending in January 2019. Rousseff promised to appeal the decision, and the country has been shaken by nearly permanent anti-Temer protests since her impeachment. “They have convicted an innocent person and carried out a parliamentary coup,” Rousseff stated.